Dr. Chalyse Shaw has been serving the chiropractic community for over 23 years. A native of Murrysville, Pennsylvania, her pre-med studies took her to Allegheny College in Meadville, PA. She earned her BS degree in Human Anatomy as well as her Doctorate of Chiropractic from the National College of Chiropractic in Lombard, IL. Driven by the goal of one day operating a total health practice, Dr. Shaw returned to school and was awarded a Masters Degree in Human Nutrition from the University of Bridgeport. 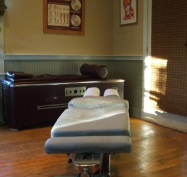 After working as an associate in Baltimore for six years, Dr. Shaw opened the Shaw Chiropractic and Nutrition Center in Hereford, MD in May of 2000. Chiropractic Techniques: Dr. Shaw personalizes her treatments to each patient’s individual needs and uses a variety of different chiropractic techniques to mobilize and realign the spine and extremities. Traditional Diversified adjustments are used as well as low force techniques such as Flexion and Distraction, Activator Methods, and SOT (sacro-occipital technique). Physical Therapy: Dr. Shaw addresses the soft tissue component of spinal and extremity conditions with the use of physical therapy modalities. These modalities help to reduce localized pain and swelling as well as speed up the healing process. Treatments are customised to the individual patient’s needs and can include: electric stimulation, ultrasound, microcurrent, heat, ice, massage and mechanical traction. Home Care: Dr. Shaw encourages her patients to take an active role in their recovery and makes recommendations on at-home treatments such as the application of heat, ice or muscle rubs. She also prescribes specific exercises to elongate and strengthen supporting tissues. Low back supports, custom orthotics, seat cushions, pillows, traction units and TENS units are also prescribed on a case by case basis.